Walnut Wood House Marker - - made from durable Brazilian walnut. Wall mount. 100 percent solid, weather-resistant, tropical hardwood. Stands up to any climate. Line 1 holds up to eight numbers. Line 2 holds up to 20 characters. Two font choices: trajan and futura (shown in small image on right). Three color choices: black, white, and green. Your address number and street name are carved into the wood and painted. Dimensions: 16"W x 7.25"H x 1". 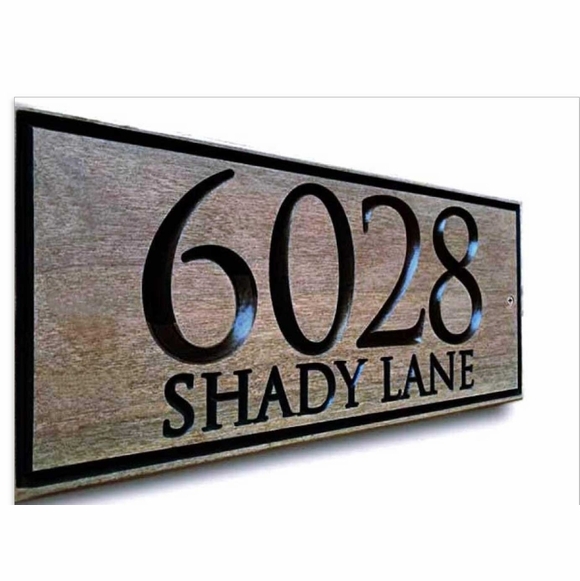 Address shown above: 6028 Shady Lane.